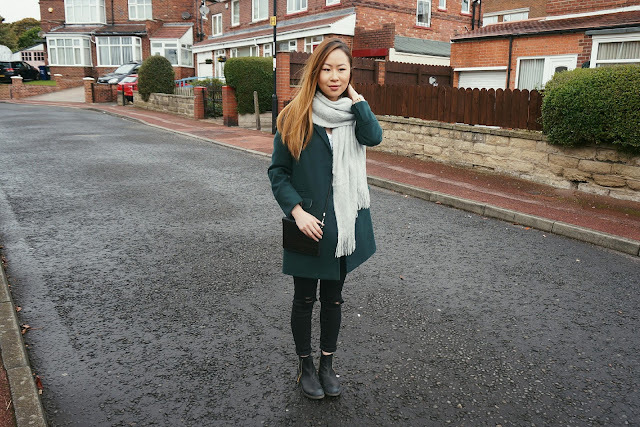 My first official winter look that I put together after picking up this beautiful green coat from Topshop and a few recent items featured in The Wardrobe Edit #3. When I first tried this coat on, and left the store without it, I couldn't get it out of my mind. So like all people do I bought it in the next 2 days - it's one of those regret it feelings that I had and I knew I would love this piece for the next season. The coat has a slim line detail and is a perfect length for me, reaching mid thighs ( I am 5, 5"), and is a build able piece to add more layers without the coat looking bulky - I can already see myself wearing this outfit walking through the Xmas markets (a bit early- I know) adding a jumper underneath and a hat & gloves. 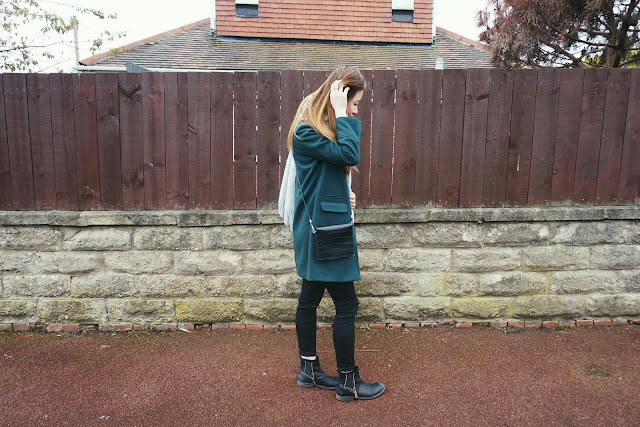 A small black shoulder bag, just to carry your necessities to free up your hands to slip into the deep pockets for warmth or to carry your coffee or tea round. I had so much fun shooting this with my friend avoiding cars every time I stepped onto the road, and spent the day eating junk, homemade burgers, oven fries (which is the best!) and watching films and playing with make -up! Which is the most fun I have had since being ill for about 5 days now on my week off from work :(. I've stayed at home and I am watching PPL (I've just started) and now I'm planning to start a bath, since I can't get warm. Aside from all that I hope you have a lovely week! That's a beautiful coat! I love the colour of it so much, and I'm not usually a fan of green! Love your outfit. So gorgeous! Such a gorgeous color for a coat! this is such a great color. I love that color, so unique! Gorgeous coat, the colour looks suits you so much and if you can't stop thinking about it - buy it!